The Walk for Water was sponsored by the Swampscott and Marblehead High School Interact Clubs, along with the Swampscott High School French Club. In honor of World Water Day, students from Swampscott and Marblehead high schools gathered on Friday afternoon for the second annual “Walk for Water” to benefit The Barka Foundation. Barka is a non-governmental organization that provides clean water, sanitation and hygiene education to rural villages in eastern Burkina Faso, a landlocked French-speaking nation in West Africa. The Walk for Water was sponsored by the Swampscott and Marblehead High School Interact Clubs, along with the Swampscott High School French Club. Interact is the youth division of Rotary International. The Marblehead and Swampscott chapters of Rotary have a longstanding partnership with Barka and have provided the organization with both financial and logistical support. Melissa Albert, French teacher and SHS French Club advisor, coordinated and supervised the walk along with Stephanie DeOrio, SHS Interact co-advisor. They set a goal of six kilometers, which is the average distance people (mostly women) have to walk each day in order to gather water for drinking, cooking, bathing, laundry and other daily needs. 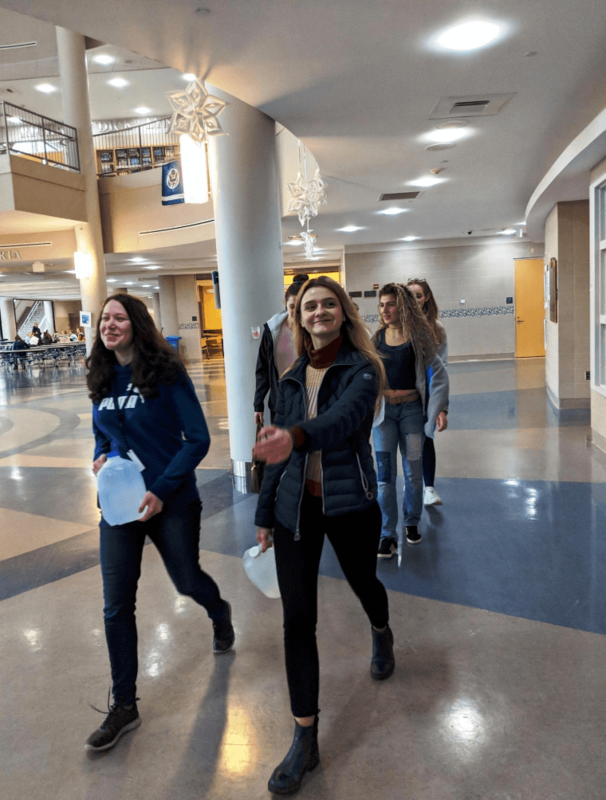 Students solicited donations from the local community and — due to the inclement weather — mapped a 6-kilometer route around the interior of Swampscott High School. Most walked toting gallon jugs of water, a fraction of the average amount, five gallons, that women in rural Burkina Faso must carry each day to fulfill their families’ basic needs. The United Nations declared clean water to be a fundamental human right in 2010. Odin Randell, SHS junior and French Club member, summed up the importance of the “Walk for Water” and World Water Day. “Water remains critical for humans regardless of how far we think technology has advanced. The walk can only begin to show the lengths that countless people have to go to every day in order to obtain drinking water,” Randell said. According to the Centers for Disease Control and Prevention, 780 million people worldwide lack access to clean water, and 2.5 billion – about 35 percent of the world’s population — lack access to improved sanitation. Despite the distance that many people must travel each day in search of water, there is no guarantee the water they do gather will be safe to drink. The UN estimates that 2,200 children die daily from waterborne diseases like cholera, typhoid and dysentery. For almost a year we've been hearing from folk on the ground in #BurkinaFaso that militant Islamists have basically occupied entire towns and communities in the eastern region, walking around with impunity; @guardian is the first to put this in print, barka. ACLED Executive Director Prof. Clionadh Raleigh discusses the surge in conflict with @NPR's @WBEZWorldview @WBEZ.